For centuries, compasses have served as a critical navigational tool for journeyers. The flat, circular device orients travelers by designating their location in relation to the four cardinal points: north, south, east, and west. Nowadays, such tools are digitized and part of everyday devices, from automobiles to smartphones. But for the Annapolitan youths participating in Box of Rain’s Summer on the Bay program —many of whom lack access to these methods of physical and virtual transport —the compass takes on a different kind of significance. Box of Rain General Program Director Meredith Krissoff teaches Box of Rain kids the basics of sailing Rainbows. 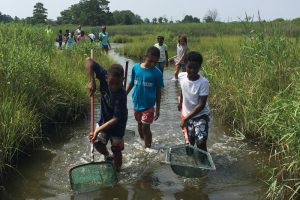 Award recipients are handpicked by the counselors and instructors who work directly with the children in water-related activities every Tuesday and Thursday over the course of seven weeks, from June to August. An awardee must have perfect attendance, display a good attitude, prove an ability to be a team player, and demonstrate leadership skills and a willingness to learn. In addition to earning the trophy, the child’s name is put on a plaque, alongside previous winners, that features a painting by local artist Kathryn Leonard. The ceremony helps to show the children what it means to win an award. The Annapolis-based nonprofit has been teaching through example since its inception 16 years ago. When 51-year-old entrepreneur and local sailor Lee Griffin was killed in a random and senseless act of violence on the night of September 19, 2002, his friends and family could have become bitter. Instead, in an effort to prevent something like that from happening again in this historic waterfront city, they banded together and developed a plan to help transform the lives of those who, like the perpetrators, live in underprivileged areas. “I was so totally driven to make things right,” says Harrington. “I almost felt like [Lee Griffin] was working through me. I was not going to start it and let it go by the wayside.” She helped cofound the charity with community activist Larry Griffin (no relation) who also runs the nonprofit We Care and Friends. They chose to name the organization Box of Rain in honor of Lee, who christened his 27-foot Hunter sailboat after the popular Grateful Dead song. It seemed a fitting tribute, given his previous video production work with the legendary folk-rock jam band and that the lyrics addressed issues of mortality and life choices while on this box of rain—this world. 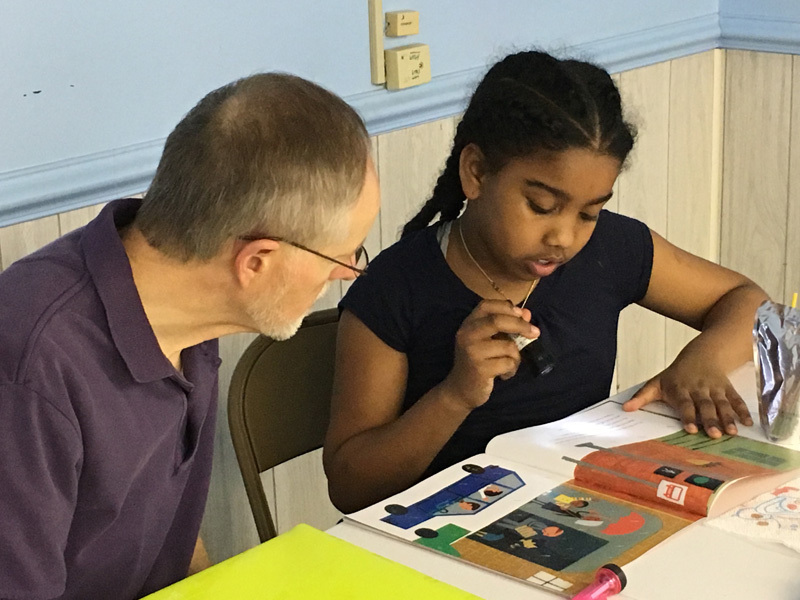 Volunteer tutor Patrick Fleeharty helps a Box of Rain child learn how to read as part of the 100 Book Challenge literacy program. 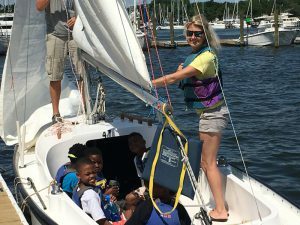 From the outset, Box of Rain’s primary mission has been to provide low-income children in Annapolis with an opportunity to get out on the water, gain maritime-based skills, learn about the Chesapeake Bay and its diverse wildlife, engage in character-building exercises, and cultivate relationships with adults and peers. “Everyone should have the experience of boating, crabbing, fishing, sailing, and paddle boarding,” says Harrington. It also provides paid jobs and leadership training to qualified teens throughout the summer, so they gain a better understanding of the responsibilities of having a job and earning a paycheck. What started as summer involvement with the youth has, over the years, expanded to a year-round commitment, helping to nurture self-esteem and self-worth and guide towards a sustainable life and career. It now includes an eight-week Build a Boat program, a Step it Up Kids fitness program, and the 100 Book Challenge. In 2016, Executive Director Karen Colburn launched an intensive, social emotional learning program called Charting Careers, starting with fifth graders and ending at graduation. Students work with guidance counselors, teachers, and mentors to determine what they want to achieve. “I noticed, three years ago when I first started, that if you don’t have continuous engagement with the kids—and I mean like every month—you lose them,” says Colburn. “I realized that we needed to be continuing relationships, and not just with the kids, but with the families, too.” Apparently, the program has done so well that the board decided it will become its own separate entity. Looking ahead, Box of Rain will return to its maritime focus and develop additional maritime relationships. 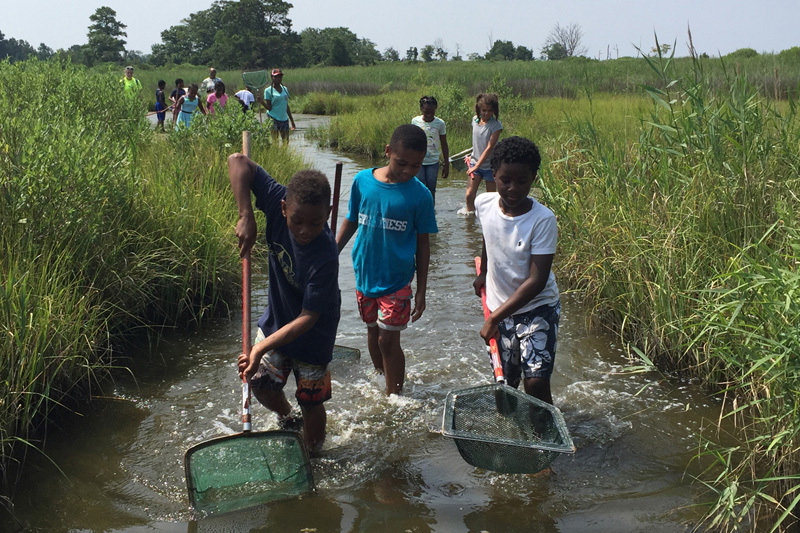 Box of Rain kids learn how to be good environmental stewards at the Chesapeake Bay Environmental Research Center. Statistics confirm the importance of long-term projects. Sixty-six percent of the 75 Box of Rain youth do not participate in anything like it, and 43 percent do not partake in other extracurricular activities. Charting Careers kids in Create the Story of You after school program show off their awards at graduation. 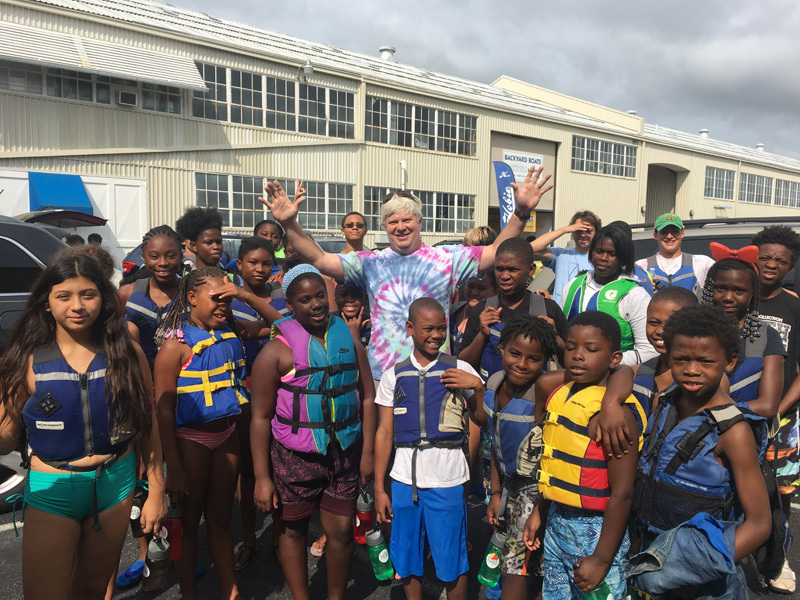 Annapolis Canoe & Kayak owner Dave Young donates his fleet of kayaks for a day every summer to 50 Box of Rain kids. Box of Rain kids collaborate on Eastport Shell station mural with local artist Charles Lawrance and Future History Now’s Jeff Huntington and Julia Gibb. Charting Careers middle and high school students tour Towson University. Summer Program Director Candi Brown congratulates Sailor of the Year Jodi Downs as Box of Rain founder and Board Chair Anne Harrington looks on. After 8 weeks of sweat equity, Box of Rain kids and volunteers show off the finished product—a Wood Duck kayak. Error: Error validating access token: Session has expired on Saturday, 09-Mar-19 15:57:50 PST. The current time is Tuesday, 23-Apr-19 01:26:21 PDT.